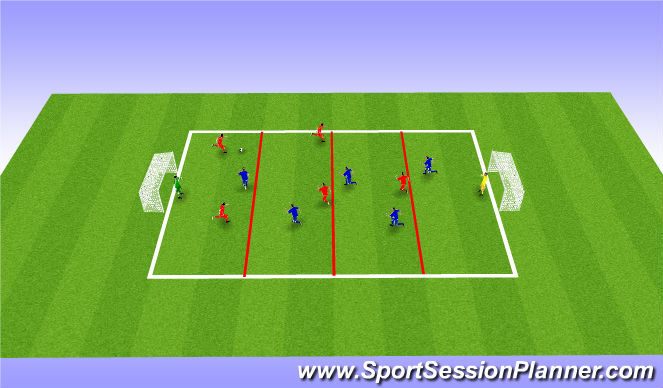 •Exploit space when running with the ball. •Use the correct technique when running with the ball. •Keep the ball close to the body. Make sure they keep the ball out of their feet and keep it under control. Try to get in to a stride with the ball remaining under control. Constant movement running with the ball. Decision making, keeping calm even when you are starting to lose control. 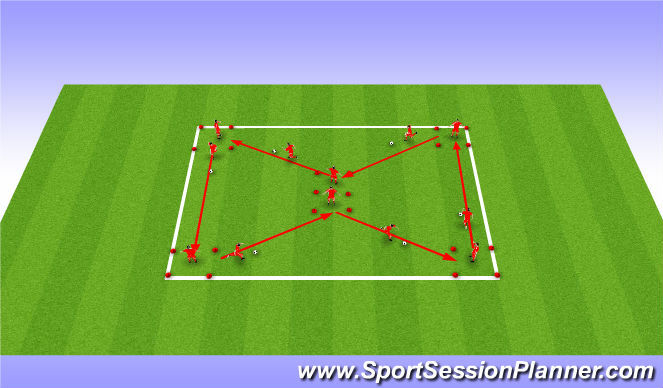 Communication with the player you are passing the ball to when entering the next square. There will be 12 players. The 12 players will be split into pairs. Each pair will start in a 5x5 square with 1 ball. The pairs will name themselves number 1 and number 2. Number ones will start with the ball and dribble to the next square where they will give the player in that square the ball. The player with the ball will then run to the next square. All number ones go at the same time. There should be six players running at once and 6 players in their squares waiting for the ball. Points can be scored when they successfully run with the ball to the next square. 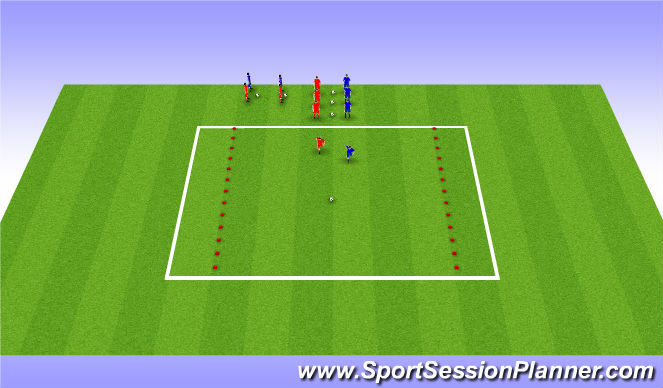 They can also challenge themselves to how many touches it takes for them to get to the other box when running with the ball, (the less touches the better but the ball must under control). 20 x 20 area with 5 x 5 square areas. 6 size four footballs, 12 size four footballs to make up the ball nests, 22 flat markers for the square areas, 8 cones to make the ball nests. Keep their head up looking for space (the square areas). Use the laces to keep the ball under control. Get the ball out of your feet. Try to get into a stride without losing control of the ball. Limit the number of touches you can make when moving from one square to another. Only use the developing foot. Decrease the square area sizes. Make the square areas bigger. More touches slow the pace down. 1 minute to set up, 1 minute to explain/demonstrate, 13 minutes playing time. Drive by – I will try not to use drive bys as much as it will disrupt the flow of the session. If I see a player really struggling, then I will use a drive by to help them and show them how to do it correctly. I may give them a challenge to help them improve. Fly by – I will make sure I keep telling the players to get the ball out of their feet and to look up for space. Communication with their partner after each turn. There will be 12 players. The players will be working in pairs. Each pair will have one ball each. There will be an end zone on both sides of the area, the blue team must score by getting the ball across the line and into the end zone on the left while the reds have to try and get the ball in the end zone on the right. The players will kick the ball into the centre of the area and, on the coaches whistle, will set off to try and get the ball who ever gets the ball must try and score by getting the ball into the correct end zone the other player will try to win the ball back and get the ball into the other end zone. Once one pair has been they join the back of the line and the next pair go. Players will be working against their partner 1 point is awarded for getting the ball into the correct end zone. 20 x 20 area with 20 x 5 end zones. 6 size four footballs (one for each pair), 12 size four footballs to make up the ball nests, 22 flat markers for the end zones, 8 cones to make the ball nests. Keep their head up looking for space. Use the laces to keep the ball under control. Get the ball out of your feet. Try to get into a stride without losing control of the ball. Use small touches to draw the defender in then accelerate away with bigger touches but still keeping the ball under control. Make the end zone smaller. Have one pair versus another. Make the end zone bigger. Have one player starting with the ball and the other ready to pressure when the coach says. 1 minute to set up, 1 minute demonstration/explanation, 18 minutes playing time. Drive by- I may set a player a challenge of having a set time limit to get the ball into the end zone I will only set this challenge if I see someone striving ahead. If I see someone struggling I may use one of the regressions for that pairing. Fly by- Praise players that are exceeding and encourage players that are finding it difficult. Try to get in to a stride with the ball remaining under control. Attempt to run through a zone with the ball. Constant movement. Running with the ball. Communication with their teammates calling for passes saying when there is a player on. The pitch will be split into 3 zones. There will be 12 players in total. There will be 2 teams of 6 players, red team against blue team. Each team will have a goalkeeper in their goal. The other players will be playing a 5v5 game. The teams must try to score the most goals to win. Team gets an extra point if a player ran with the ball though at least one full zone. One point is awarded for a normal goal scored an extra point is awarded if a player runs with the ball through at least one full zone. 1 size four footballs, 12 size four footballs to make up the ball nests, 22 flat markers for the zones, 8 cones to make the ball nests. Keep their head up looking for space. Use the laces to keep the ball under control. Get the ball out of your feet. Try to get into a stride without losing control of the ball. Use small touches to draw the defender in then accelerate away with bigger touches but still keeping the ball under control. Use the correct weight of the pass. Shoot into the corners of the goal. Ignore the zones and play a normal game. Play 1 or 2 touch. Make the zones smaller so that it is easier to run through the zones with the ball as there is less distance to cover. 1 minute to set up, 1 minute demonstration/explanation, 23 minutes playing time. Drive by- I may set a player a challenge of having a set time limit to get the ball through a zone I will only set this challenge if I see someone striving ahead. If I see someone struggling I will help them by giving a demonstration at the side of the pitch.